The Virtual Gastric Band is a non-surgical technique which uses the power of hypnosis to retrain you to be satisfied with smaller amounts of food. As the name suggests, it combines the concept of a ‘virtual gastric band’ with clinical hypnotherapy. It is a not a diet, and it is not just ‘mind surgery’, but a revolutionary approach to transforming your attitude towards food and reducing your portion sizes and appetite. It changes how you think about food and gives very safe, very predictable results. The clinical hypnotherapy convinces the brain that the stomach is full after a certain level of intake and that there is no need for more food. It is not a diet – the Virtual Gastric Band allows you to eat what you want and works by enabling you to eat much smaller portions. Because it’s not a diet, you won’t feel deprived, miserable or hungry, the issues which cause diets to fail. As The Virtual Gastric Band effectively negates these issues, you are left with a long-term solution to your weight problems. 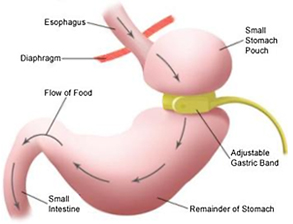 A gastric band operation is surgery where the capacity of the stomach is significantly reduced using an adjustable band so that only small meals can be eaten. It is a complex, potentially dangerous and expensive procedure, often with a long wait if being provided by the NHS. Moreover, there are no guarantees to working long-term because it is a purely physical approach to a far more complex problem. The operation may help reduce the capacity of a person’s stomach, but the issues causing a person to become overweight in the first instance cannot be addressed by surgery. Many surgery patients do not succeed in losing weight long-term for this reason! The Virtual Gastric Band is a 4-week programme consisting of 4 sessions face-to-face sessions, plus 2 bespoke CD home sessions and “homework”. It is not a short term fix. It is about creating new habits to get you where you want to be and enable you to stay there – and generally takes 28 days. The “operation” takes place during the first session, where we will fit a virtual band at the top of your stomach to create a golf ball-sized pouch that restricts your food intake. Consciously you know you have not had surgery. However, the subconscious works with imagination and does not distinguish between reality and fact, and will accept the belief that surgery has taken place. The following sessions are designed to tackle your individual psychology and personal habits around eating and your weight. Clients report losing an average of 7lb in the first week followed by steady and sustained weight loss of 1-2lb per week thereafter. In initial trials, 95% of participants achieved positive results and the programme is currently undergoing clinical trials. This bespoke programme includes personalised support CD home sessions, which you are required to listen to daily, and a set of guidelines to help cement your new eating habits. Commitment and a willingness to do the daily ‘homework’ from your side is required. The ‘homework’ is very easy and pleasant to do, and well worth the results, but you will need to set aside at least 20-40 minutes each day to complete for the duration of the programme. If you are ready to stop dieting and become naturally slim, please do get in touch. Find out whether the ‘Virtual Gastric Band’ or any of our other weight loss hypnotherapy programmes are suitable for your needs by calling Katie Glen or Jenny O’Kelly on 020 8712 5981 for your complimentary 15-minute telephone consultation.